San Francisco Chronicle: David Stern Schedules Games On Christmas Because He "Celebrates Hanukkah" And "Has No Real Feel For Christmas In The First Place"
One of the most distasteful aspects of commissioner David Stern's legacy - ruining Christmas for far too many people - comes into play again this year with five televised games scheduled. "It used to be two teams," retired coach Phil Jackson said. "But I don't think anybody should play on Christmas Day. Your little kids are putting batteries in their new toys, all kinds of family stuff going on, and now you're supposed to get focused on a game in the middle of the afternoon?" Jackson is among many observers who point out the obvious: that Stern, who celebrates Hanukkah, has no real feel for Christmas in the first place. 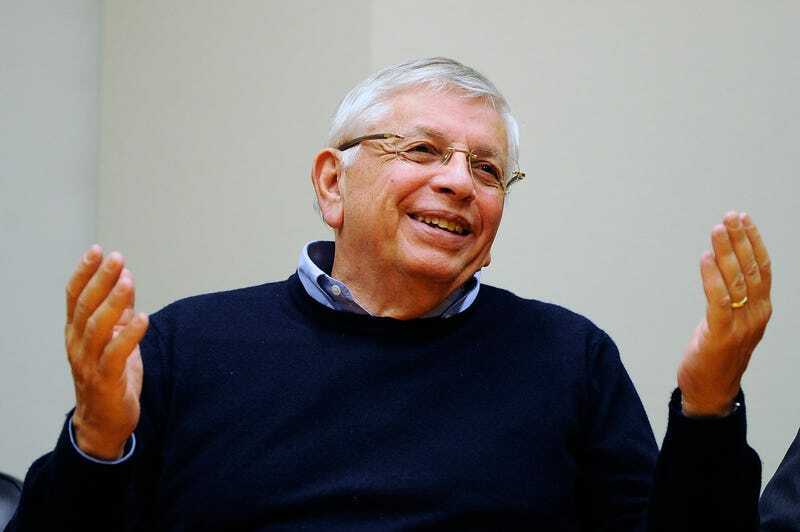 Criticisms of David Stern, though certainly not all illegitimate, are often tinged with anti-semitism: the idea that he's a schemer (the lottery is rigged every year, right? ), that he's greedy (other comissioners don't fine their personnel for infractions?) or that he's especially mendacious (because most league commissioners are consistently forthright? )—all of these play into old, negative tropes about Jews, and shouldn't be the basis for reasoned critiques. This particular criticism of Stern is not so much "tinged" with anti-semitism as it is basted in anti-semitism, and it breaks down under examination: Thanksgiving may not be a religious holiday, but it's just as important a gathering for many people, and I've never seen anyone claim that the NFL ruined Thanksgiving "for far too many people," except maybe Lions fans. And let's not forget the years when Hanukkah, invoked here to mean "David Stern is Jewish," has actually overlapped with Christmas. Such as last year. Though Christmas day games have always made Phil Jackson cranky (he's not a coach, right now, by the way, so why are we calling him up for quotes? ), they're a good tradition, far from a blemish on Stern's record. Athletes always work odd hours and are used to rescheduling celebrations, and recent Christmas games have consistently made the day better for fans. Anti-semitism aside, Jenkins is just wrong.